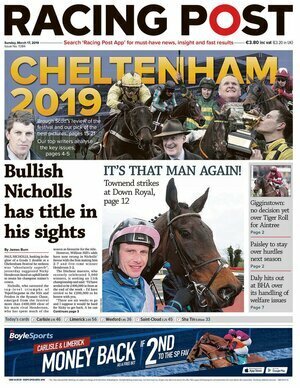 Posted in Misc and tagged De Sunday Papers at 10:41 pm on March 16, 2019 by Admin. I am not a follower of MMA fighting and all that, but fair play to Mr McGregor for upstaging Mr PR. Did the boyfriend not march with Leo? Was he only making an appearance for the headlines vis Pence etc? The handlers took their eye off the ball once they got the headlines of Pence. And for GAWDs sake could nobody change Leo’s sash to the correct way around? You are a woman of intelligence living in Dublin. You spend little time in Cork or Belfast so please… type normally? If you want to discuss what is happening in Keady then let’s go. McGregor & Fake Taoiseach? I’m delighted. It couldn’t happen to a better plastic pr’d to death fake tee sock. Teflon tory. Seriously? I’m no Leo fan but you prefer our nations greatness loudmouth scrote embarrassment to Varadkar. Some folk I swear. The Ireland rugby squad’s performance yesterday reminded me of Monty Python’s philosophers’ soccer – without the philosophy, humour, skill, or talent. And I for one has been made to look a prize tool by the goys in green. Like,only a few weeks ago I was tipping them for the Grand Slam,world cup glory and the Eurovision song contest. Now we’ve just got to be grateful for not finishing below Scotland. I dunno if that investment in a 4XL Ireland shirt was really worth it after all – I mean we’re totally not going to get past the qualifiers in Japan now. Where did England finish last year Ollie? Good job McGregor (and kudos to Katie Taylor too for her latest title btw). Upstaging a hashtag/selfie-obsessed Taoiseach who can’t even put his sash on the right way is probably easy enough, but fair dues to The Notorious for representing Crumlin in style in Chi-town and ignoring Castleknock. 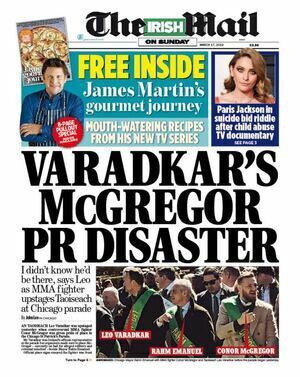 Perhaps Varadkar the Official Ireland MMA (Multi Media Amateurism) Camp. 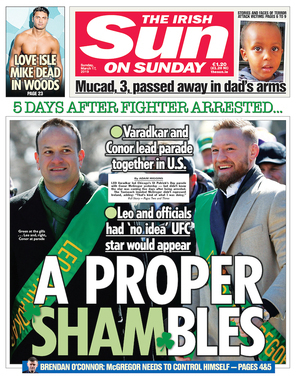 The pearl-clutching papers are criticising Leo for marching close to Conor McGregor. But what should Leo be concerned about? A few minor traffic violations, throwing a chair at a bus of a rival that looked like something out of the WWF, or the most recent transgression of taking a mobile phone off someone? It’s hardly murder now, is it? Has Conor been lauded left, right and centre in Ireland, when was the last time he was on RTE and the Late Late Show. 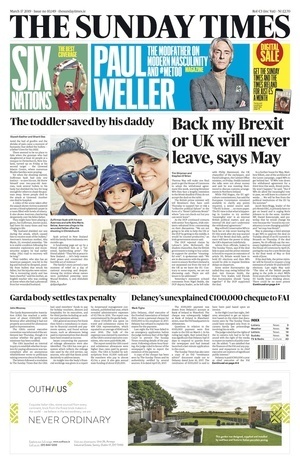 The headlines today, it’s almost as if the papers are suggesting there’s something far more serious that Leo should be concerned about with Conor. 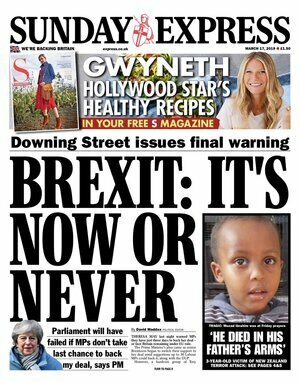 But wouldn’t the papers be in contempt of court for making any such suggestion. Are Leo and his people so out of touch that they don’t actually know what’s not publishable? While Leo was marching with McTrash,Mary Lou received rapturous applause and cheers in NY-weather cooperated but was windy. I’m sure she did. That banner, and the fact that the parade did not allow gay groups to take part in the parade under their own banners until 2015 should make it clear to all how out of step the organisers are with the mindset of Ireland in 2019. Yeah you’ve been such a champion of LBGT and women’s rights on here…. By any metric Leo’s visit has been a unmitigated disaster,even his most ardent and blinkered supporters want it to end-he’s just not a statesman it’s thats simple. He’s big day out in Chicago gets hijacked,this is just a distraction,the whole banner nonsense. He failed again on the biggest stage-upstaged by a two bit,has been fighter out on bail…. That’s it Johnny – be sure to deflect, deflect, deflect, and talk about everything other than the point that was raised. Can he not dress himself-what’s the point-she hardly made the banner.Like most VIP’s in NY she moved between banners/counties signs etc. Hold the front page SF leader stands beside republicans in public on parade in NY-meanwhile are we supposed believe McTrash,got by that level security and it was a-who dat moment for Leo.He just turned up at the front the parade…. Like any other news story involving Conor McGregor, i neither know nor care about it. Tbh, I don’t think that any Irish politician, from any political party, should have anything to do with the reactionary bigots that organise the NY parade. If it it was Northern Ireland instead of NY, and some other group wanted to ban gay banners from one of their numerous parades, SF would be the first to decry the situation, and rightly so. But as Mary-Lou needs to keep the Noraid money rolling in, she will happily pose for pictures at an event that SF would not give the time of day to on the other side of the pond. It’s a non news story,Rory just won’t the players,did you just find out the history of the NY paddy’s day parade,good for you. ‘Ultimately, I believe in the politics of engagement rather than the politics of boycott. I think you’ve a better chance of changing heart and minds through relationship-building and persuasion rather than turning your back on people,” he said. The papers have reported on him punching many people in pubs. He injured several people when he threw that handcart at the bus. If your face was scarred by him you might think differently. #sashtag. Oops. Forgot his media people (SCUm) are supposed to be disbanded. The boy Varadkar makes a clown of himself two years in a row. #sashtag – love it! Make a hashofithashtag. Enda Kenny also ‘didn’t know’ Denis O Brien was a guest on the podium in the NYSE, until iw was revealed a month or so later, that he knew 12 days in advance. And the excuse that time, like this time, is that the guest list wasn’t known to him. Two peas on a pod, our Inda and Leo. Is Leo a bad idiot, who hates the poor and only cares about voters inside the M50? What level of gobpooery have you reached at this stage? Junior Cert? You’ve gotta be the greatest serial whinger known to man. Politics or social media is not for you. Take a break and give your mental health a vacation. That’s great advice from a serial name-changer. Comment sections are obviously not your friend, nor forte. A proper Charlie. Charlie’s right. What age are you – mid60/s going on 90/s? 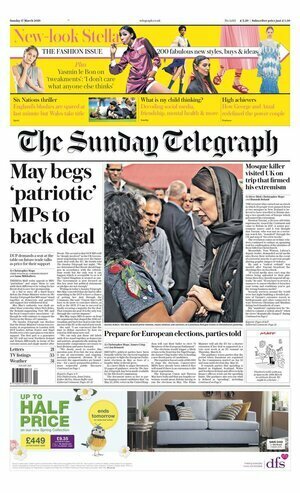 The Sunday Times has the beginnings of what could be a decent story. The FAI CEO John Delaney gave €100,000 to the FAI in April 2017 and seven weeks later the FAI gave John Delaney €100,000. How odd. Why? 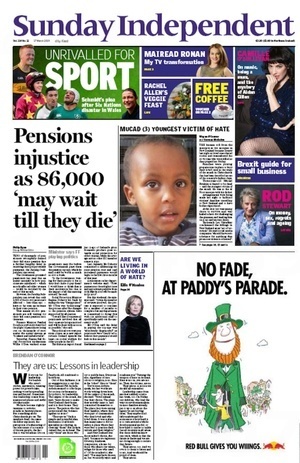 The Sunday Times doesn’t have the answer in today’s paper though John Delaney did go to the High Court yesterday and in a 3-hour hearing unsuccessfully sought to quash the story. The FAI has issued a statement after the Sunday Times went to print (cries of “sods” in the Times newsroom). It claims the €100,000 was a bridging loan “to aid a very short term cash flow issue”. Why would such a huge financial organisation need such an unconventional short-term digout and why was there no mention of the transaction (related party, loan, surely) in the annual report? As I say, could be the beginnings of a decent story. 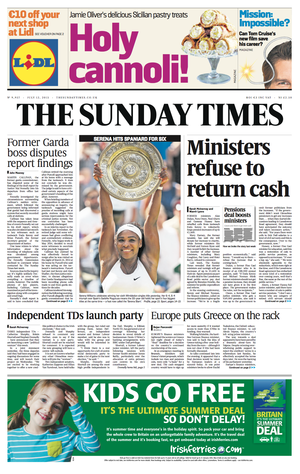 (2) Seven weeks later, FAI gives Delaney €100,000 claiming it was a short term loan. That’s iffy for what is a huge financial organisation. Why did Delaney want to stop this info coming out? Why isn’t the transaction shown in the financial accounts or notes? Given the whiff around Delaney and the FAI, it’s worthy of further questioning, could be the beginning of something explosive. I wonder was the initial loan in cash? There are few football associations that aren’t a bit stressed stinky I reckon. Enter stage left-10 million,are the FAI accounts public ? ‘Mr O’Brien had been contributing to the wages of the managerial team since the appointment of Giovanni Trapattoni and Marco Tardelli in 2008. When reunification does come about, Mattie McGrath and Carol Nolan might find a new home in the DUP. The anti-abortion group Family and Life funded Mattie and Carol to visit Washington this year. Last year, they gave the DUP money with Ian Paisley junior and another couple of DUPers being funded to visit Washington where they undoubtedly spread the anti-abortion message. 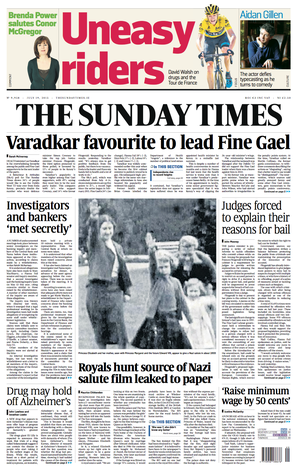 The Sunday Times has half the story this week. A small minority of the Yellow Vest protesters in France yesterday engaged in riotous behaviour (the French police aren’t exactly angels though) and this poor Porsche was in the wrong place at the wrong time. There is still very little reporting in Irish media about the weekly protests and any reportage focusses on the violence of a tiny minority. Numbers protesting were up yesterday at 32,300 (exactly!) say the French authorities though others say the turnout was far higher. 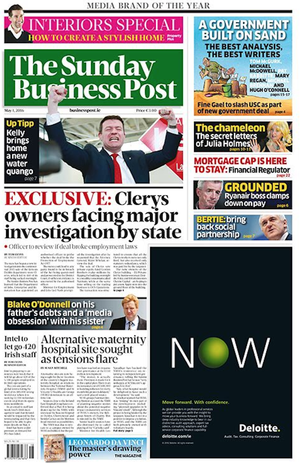 How are things going at the €30 million Siteserv inquiry which FG appears determined to undermine. Catherine Murphy doesn’t want to reveal the sources which gave her the info which enabled her to make the comments in the Dail which forced this government to establish the inquiry. 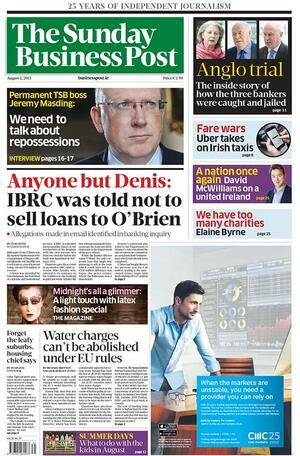 And Denis O’Brien wants to find out who squealed about his banking affairs (we’d all love to find out the deets of Denis’s purchase/repayment of his loans after IBRC was liquidated by Noonan but the FG govt refused to allow the Siteserv inquiry look at IBRC dealings after Feb 2013 when the bank was liquidated). Under FG, the Siteserv inquiry has been “extended” five times and is now costing multiples of original estimates and many fear it won’t actually do what it was supposed to do. And all we wanted was for it to examine if IBRC acted correctly when it sold Siteserv to Denis O’Brien for a song in controversial circumstances. It doesn’t take four years to do that. It takes four + years to try come up with ways to block it. 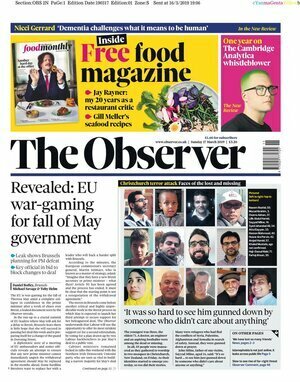 It would have taken four weeks but FFG interests need to run for cover. Jon Johnson disappearance must be devastating for his family. We are a country where you can vanish & become a statistic . And tragically it’s accepted. Unfortunately we are all too familiar with people disappearing and bodies turning up soon after. Do many just assume it’s suicide at this point? Unless if it’s deemed there’s some kind of criminal element to it, it barely makes the news. His case is baffling though…. baffling with the facts we know though. I guess we don’t know the full story. Varadkar: “Mr. President, just wanted to say thanks very much for meeting us again. It’s an enormous privilege for Ireland, as a small country, to have this annual meeting on account of St. Patrick’s Day, and it’s a chance to make even closer and tighter the bonds between the U.S. and Ireland. Here is the lawsuit filled on Friday in NY. Leo puts his two feet in it. Good job he isn’t a centipede. 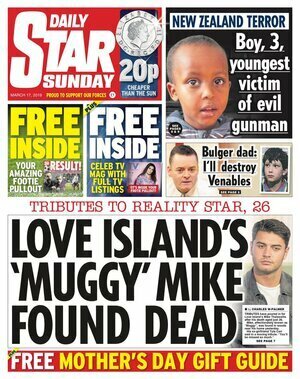 Pity the Sunday press doesn’t fulfill its traditional role of analysing the week’s events. On the NZ atrocity, should the 16-minute go-pro style video, live streamed by the killer, be banned? If there was no video and an innocent bystander across the road managed to take a photograph, there’d be a bidding war amongst the papers for the photo. Should people see the video to consider how they’d react in such a nightmare, what now for the run-hide-fight advice? Why is Twitter and Facebook the censor, what else will they censor? Should the 9/11 airplane crashing into WTC be banned? And why can’t we any longer see the video of Clint/Kelsey etc the day after 9/11 looking all pathetic as they tried to be defiant? I watched the video yesterday, it’s horrible and truly disturbing and certain images will stick, I think I’d prefer not to have watched it. But, shouldn’t that be your choice? Stop cheering or favouring McGregor ye bunch of feckin’ eejits. So the representative body of An Garda Siochana who are charged with policing the law in this country have been found to be not compliant with the revenue laws in this country. FFS, reason 1546 why Ireland is laughing stock of the world. Banana republic led by the most inept bunch of tossers this country has ever seen. So, anyone else enjoy a parade mostly consisting of tractors, balloons and small children with flegs. No! Did yizzers enjoy it? Richie Ryan has passed away. 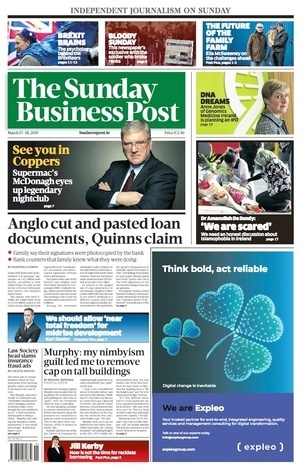 Not a bad Finance Minister in some respects. He suggested a wealth tax, which was quickly shot down by Bruton and the rest of the FG rich boyos. “Former Taoiseach John Bruton, who was then parliamentary secretary to the Minister for Education, voiced his grave concerns about the tax proposal in a letter to Taoiseach Liam Cosgrave in May, 1974.